Image Comics, known for their support of creator owned comics, has become a favorite of comic enthusiasts. They have put out many critically acclaimed and original comics such as Chew, Saga, and Manhattan Projects. 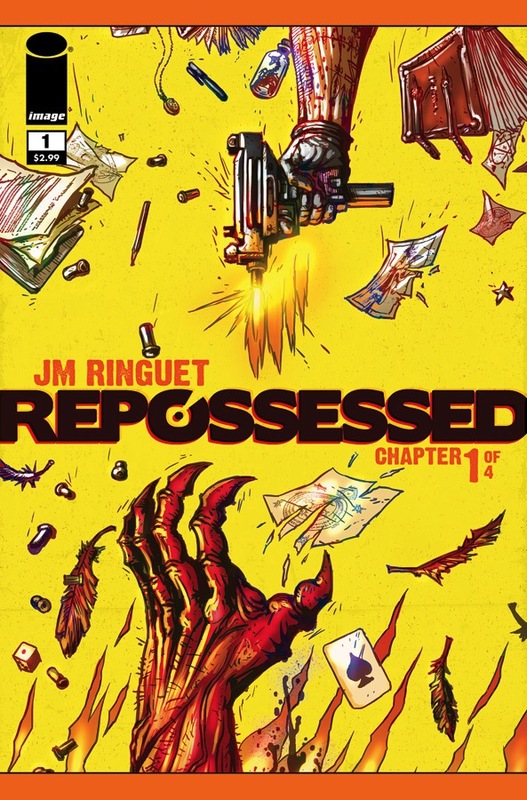 Now they offer Repossessed, about a group of demon killers that “repossess” bodies from the hell spawn. Find out if this stands with the Image greats, with your Major Spoilers review! The ideas supporting Repossessed are interesting, and I am a big fan of urban fantasy, so I expected this book to scratch the itch I get when I watch the Blade movies. Unfortunately, the writing is so sloppy that the book did not satisfy anything. The plotting is kind of a mess, relying on coincidence, and with plot hooks just kind of appearing due to a character’s “connections” and other superfluous explanations. The main characters, a trio composed of the “muscle,” a mage, and a girl who does not seem to really serve any purpose (she does not even help fight demons), are just very poorly thought out. They are less characters, and more like the shells of what a kindergartner might imagine the characters to be. The dialogue is very awkward at times, breaking some very basic rules of conversation flow. There will be pages where it feels like each panel was written completely separately from the each other. The lines are really messy in this. Its almost a stylistic choice, but it mostly comes off as too “crowded.” The coloring has a very autumn palette to it, which give off a kind of light hearted feeling that does not fit with the tone the words seem to be shooting for. There is also this kind of computer effects finish over everything that makes it look even uglier. Additionally, the bodies often fall have awkward and unusual positions. There are some panels of beautiful, grand designs, especially of the demons themselves. Unfortunately, that is not enough to redeem the art as a whole. I can not, in any good conscious, recommend this book. It is definitely not the worst thing I have read, but it sure as hell was not the best. Its just so lacking in so many areas, and not worth adding to your pull list in a time where comics are more expensive then ever. If you have an itch for some urban fantasy, like I do, go read Hellboy instead (or just re-watch Blade). Wow, you did not like it didn’t you? Can’t satisfy everybody. Thanks for reading!